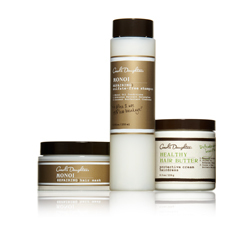 Afrobella Anniversary Giveaway – Carol’s Daughter and Mary J. Blige’s My Life Blossom PLUS Monoi Hair Goodness! Afrobella Anniversary Week = all giveaways, all week long! This one’s from one of my favorite brands – Carol’s Daughter. We’ve both come such a long way. Little known fact about this here blog — Lisa Price was one of the first entrepreneurs I met in the natural hair and beauty business. A Carol’s Daughter event with Mary J. Blige was one of the first celebrity beauty events I ever attended. Carol’s Daughter was among the very first brands to send me product to review (and they were gracious when my review included constructive criticism about packaging). Back when Afrobella.com began, Carol’s Daughter had just begun to truly expand — I believe their store on 125th Street in Harlem had recently opened. It was an exciting time for natural hair – you could see the beginnings of so much promise everywhere you looked! Carol’s Daughter has grown and evolved so much. I feel a sense of personal pride when I turn on my TV and there’s Lisa on HSN, flanked by celebrities who all agree that they love her products. I’ll definitely be watching this weekend — on 8/13, Mary J. Blige will be on HSN launching her new My Life Blossom fragrance. On the Carol’s Daughter Facebook page (have you clicked like yet? Whatcha waiting for?) they’ve been hosting a daily give-away for a MJB prize pack in promotion for Mary’s appearance on Saturday. Today’s your last day to enter that giveaway! 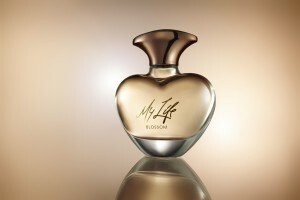 This weekend, $1 from each sale of My Life Blossom fragrance this weekend will go to Mary J. Blige’s charity, FFAWN . And you can tweet Mary (@MaryJBlige) and Carol’s Daughter (@Carols_Daughter) while you watch, using the hashtag #MJBMyLife! They’ll be reading and responding. If you missed out on the Carol’s Daughter FB contest, fret not thyself bellas. You can win fabulous Carol’s Daughter prizes right here! All you need to do is leave a comment below. Which song from Mary J. Blige’s My Life is your favorite? There’s no right answer here because they are ALL classics if you ask me! This contest is open to US and Canadian bellas. 5 lucky winners will be chosen, and they will win a bottle of Mary J. Blige’s latest fragrance My Life Blossom AND Carol’s Daughter Stronger, Invincible, Natural set of haircare products, which includes the Monoi Repairing Shampoo, the Monoi Repairing Mask, and their Healthy Hair Butter. This contest will be closed next Tuesday. Good luck, bellas! Hi Bella!!! I usually don’t enter contests but I love me some Mary! I LOVE MJB! I’m Going Down has significance for me, because she helped me through a tough period in my relationship!!! Bless you Mary!!! Now how in the world can I pick just one from that album? You’re right, the whole album is a classic, but I will say “I’m The Only Woman” & “I Love You” are favorites. Thanks for hosting these giveaways! Happy 5th! I played that CD until it had marks! “My Life” is the best song, because EVERYBODY has felt like the words in that song at some point in their lives. Great, great, great anniversary, Afrobella!!! “My Life” is my favorite. Be Happy! But my all time fave is Real Love! “My Life” is my favorite. Thanks! ‘Be Happy’- I think all women have that moment in their life where they decided to live for themselves and not other people. It has to be “My Life” haunting song, I love the lyrics. My Life will always be my favorite song off of that album. I know that no matter where I am in my life there is something about that song that ministers to me. Mary’s personal struggles during that time taught me that even in the midst of your personal struggles there is healing and beauty in sharing your testimony and giving to others. While that could have been one of the lowest moments in her life it continues to be a record that gets so many others through even to this day. I love Mary! She is a powerful overcomer and deserves all the many blessings she is reaping right now! OMG! The whole “My Life” album is straight vintage!! But I think that every woman wants to be happy in and with her life so I have to represent for my sistas of the world and say “Be Happy”!! I think is the women of the world anthem, because wel all want to be happy! While I agree the whole album is just…magnificent flava in your ear, I have to go with My Life. At some point in your life you have uttered these words; to yourself or out loud EVERYONE can relate to that track! The song, “My Life”, is soul stirring and gut wrenching. She sang her heart out in that song. Real love is a Mary classic! I’ve loved Mary since What’s the 411?, but “Just Fine” is one of my favorite songs because it celebrates the joy of being content in your own skin. There is nothing better than loving yourself just as you are! Hard choice to make since that’s my fav album of MJB but I’d have to say “Mary’s Joint” is my favorite b/c I like the beat & can relate to the lyrics (I think at some point we’ve all been there). Hello Afrobella….I love Mary J. Blige! My favorite Mary J song is “Real Love” it’s a classic! like everyone else, im going down! I love the whole album– but if I had to chose it would be Mary Jane(All Night Long)!! I remember riding in my sister’s yellow Cadillac with the speakers up and the bass jumpin’!! My fav is “I’m Going Down”! No contest! “Be Happy” is THEE song from this project! I like Mary J. sooo much! She is such an inspiration to women! My favorite song by her is “You Bring Me Joy”! Too many to choose from, but I’ll start off with You Gotta Believe. Awesome album from beginning to end! My favorite from the album is My Life! Love that song! It has to be You Bring Me Joy- the intro to this song is awesome and the lyrics are so resounding! Ooo the bass that bangs when “Never Can Live Without” comes on! I just rocked that on a 8 hour trip last month!! Had to make sure the bass and treble were set just right and I played that Cd at least 4 times round trip!! My bad its “Never Wanna Live Without You”, ha I’ve been singing the wrong words all these years!!! But you couldn’t tell me nothing! I absolutely love “You Bring Me Joy”. I love this Album!!!!!!!! Be With You…..CLASSIC 90s song!! My favorite song on this album is “I’m Going Down,” hands down. Great song! I would have to say while the entire album is classic, My Life is my fave!! Her lyrics on that song encourage women to embrace who THEY ARE. I LOVE IT!! My favorite song is Share My World!!! “My Life” is my fav! “My Life” is my favorite track on “My Life”. Mary J Blige is my favorite female singer of all time. I’m going down is my jam I still, to this day, sing it at the top of my lungs wherever and whenever I hear it as if I just broke up with my boo. At this phase I’m going to have to say “Be Happy” is speaking to me. My life is one the most best songs ever! !and no one can disagreed with that. My Life is my favorite, such meaning for so many. Whew this was a hard one, but Be With You has to be my fav. “I’m Going Down”. Who hasn’t felt that way. Just Fine – great workout song! My Life. Who doesn’t want to be better understood? Be Happy! But the whole album is classic! “Just Fine!” words to live by. My favorite song is Be Happy!!! It’s gotta be Share My World from the album of the same name. My Life because it’s a great song and a great tribute to a throw back. “I’m going down” is the bomb.com! My best Mary song is “Real Love.” I can remember getting Mary’s first album “What’s the 411? back in the day. Real Love still gets me moving when I hear it. I love love love “Mary Jane (All Night Long)”. It gets me moving every single time and the bass line is sweet! “Be Happy” is my favorite! “All Night Long”! I’m an 80’s girl! My favorite song on the My Life album is Be Happy. Love it. Even though ‘My Life’ was speaking to me, ‘MARY’S JOINT’ was my favorite. Be Happy. I love you Mary!!! Real love is my absolute favorite!!!! Title track – My Life! Love the whole album, but “My Life” is my favorite song. Anytime I hear the first chords in Mary’s songs I get into this swagger/grooving mode 🙂 and all the songs on this album easily put me into that mode. But the one song I catch myself singing the most is ‘Be Happy’. “You Bring Me Joy” is my favorite. “I’m Going Down” is my favorite song from that album. Wow such an unfair question. You can’t pick a favorite with Mary J, all of her songs are awesome. But since I must pick one, it’s “You bring me Joy” AMEN!! Be Happy is my fav on her My Life album. I’m Going Down was my JAM when this album first came out and I still love to sing along with Mary J!! That album is full of favorites but right now my favorite is I Love You. The beat is what does it for me on this song. As you said, that album is CLASSIC. But, I really like “Be Happy” over everything. That’s what everyone in the world strives for, right? We just want to BE HAPPY! My favorite would probably have to be “Just Fine”. It’s such an empowering song. Mary J. Blige is one of my favorite female artists, I think I have all her albums. My favorite song from “Mu Life” is I’m Going Down”. Mary J. Blige is such a great artist. My fave song from this album is “I’m Going Down”. I could just feel the emotions through her voice, but that’s with any Mary J song! “BE HAPPY” is my all-time FAVORITE song from Mary J. Blige’s My Life album!! Be with you is my favorite. My favorite MJB song is “No More Drama”. That song came out smack dab in the middle of a season of constant family drama. That song was my anthem that summer. It gave me the inspiration to walk away from all of the drama and let my crazy family fight amongst themselves. I’M THE ONLY WOMAN has to be my favorite song from the MY LIFE album because it wasn’t one of the songs you heard a lot on the radio. Besides that, the content is very strong. I love “Be Happy” and “My Life”…I love Carol’s Daughter! I love ‘My life’! Hope I win. Be Happy…..sometimes you have to preach to yourself…Be Happy and speak it into being…. My favorite, feel good cut is “Be Happy!” Just listen to the first verse, “how can I love somebody else, if I can’t love myself”…this line speaks VOLUME! Love thyself and make happiness your ultimate goal! Sang it Mary!!! Hello Bella! This is a hard question to answer. Like you said they are all classics. If I have to choose it would be “Be Happy”. I think that song is universal for everybody especially women. When it comes down to it that’s all anybody really wants. Even though I was at the young age of 4 at the time, “I’m goin’ Down” was my favorite song in general. & I still love it. Much thanks to my mom & her great music taste. My favorite has to be Mary J. Blige’s “Be Happy” off of the My Life album. Thanks Bella and Happy Anniversary!! Definitely my favorite song from the My Life album has to be “Be Happy”…I’ve always loved that song and the title speaks for itself…all I really want is to be happy! I’m going down is my favorite song from the My Life album! My favorite songs from this album are My Life and I Love You!! I’m Going Down is my FAV from the My Life album….that’s my jam!! “No More Drama” is my favorite and the anthem I LIVE by!! When I was going thru my own personal “dramas” with my job, family and boyfriend– this song helped me to make some serious changes not only with everyone who was bringing drama, but to make some changes within myself for the betterment of myself… Every now and then, when things get “rough”, I just simply put this song on, and take a moment, and take the time to think, and to make a decision as to what’s right for me. You Bring Me Joy! is my favorite. One of the originators of the Mary J. bop/walk/dance I adopted. “Be Happy” i had just ended a very long relationship and this was my theme song! Whenever the single girl world knocks me down, I listen to MJB’s “We Ride” and am instantly again a champion for black love. You Gotta Believe is one of my favorites from My Life album, and congrats on five years strong!!!!!!!! Take Me As I Am. Song from my heart! Take Me As I Am. That song is how I feel. I love the song “You Bring Me Joy,” when this song came out this song expressed so much of how I felt. Those times have passed but my love for this song is still there. Classic album. If I have to pick a favorite it would be, “I love you”. OMG, “I’m going down” was my ish. I wasn’t even a teen, but I felt that song so strong in my soul. Had never experienced heartbreak, but Mary made me cry. When she sings you FEEL it. My fav track from MJB’s “My Life” album has to be the title track…My Life! Til this very day I get emotional when I listen to that song, but fee lso empowered afterwards. My Life is one of my favorite Mary albums, being it’s that I have all of them, My life is always on constant rotation on the mp3 player. From that cd Be Happy is the one I listen to most often. I loved and still love Be Happy….that’s my anthem EVERYDAY! All that I can say …. what ! The lyrics , the beat , just make you want to have a glass of red wines , love your loves and feel blessed because of your needs … Love Ms MJB ! My Life, You Remind Me–great album all around. No More Drama & Take Me As I Am, they fit certain periods in my life like no other. Everytime I hear them they remind me of those times. My life and No More Drama are two of my favorite MJB songs. They took me through some difficult times in my life and No More Drama helps me to declare victory. “Be Happy” always gets me feeling some kinda way! no more drama is my favorite mjb.song, because i don’t need to experience drama in a loving relationship. “I Can Love You” with Lil’ Kim brings back great 90s memories! Now more than ever, people need to hear music that makes them feel good. We are bombarded with so much negativity- especially when it’s considering black women. All I really want is to be happy. It’s a choice and I choose it! This is why MJB’s ‘Be Happy’ is one of my absolute favorites. My favorite song from Mary J. Blige’s My Lyfe CD is Be Happy!! Lyfe throws us so many lemons sometymes and I really do make Lemonaid! No matter how many tymes and how hard I fall I stand back up and strive for always seeking Joy!! Because I just wanna *Be Happy*..Her works touch deeply because her music is about REAL LYFE situations!! My fav song on Mary’s My Lyfe is Be Happy. Its a classic that never gets old! “Not Gonna Cry” from the Waiting to Exhale Soundtrack was my all time favorite song from Mary J. Blige. It exuded pure empowerment for all women to love themselves and to be independent. Mary Jane has to be my all time favorite! My favorite song on My Life is I’m Going Down. You Bring Joy.. my fav…. My fav is definitely I’m Going Down! My Life, My Life, My Life! I would choose the Almond & Honey fragrance. It would be a very sensual fragrance with some moisturizer. I’m going down is always classic! My favorite song would have to be “Just Fine”. I think it’s a celebration of life. We all have to deal with people and circumstances that can be trying but this song is like an anthem for overcoming it all. Plus it’s great to dance to. “You Bring Me Joy” is my favorite. Thanks for this giveaway, Afrobella! I like “No More Drama”, because I do not like drama and it is also the song that came on video when my 10 month old busted a move to, back in 2001. She still loves to dance! This was my favorite album during my sophmore year in college! The song I liked the most was Mary Jane. my fav would have to be My Life. I like No More Drama also! my favorite is “Be Happy”. “Be Happy”! I love it! The title track “My Life” is my favorite song from the album because you can tell that Mary has grown and she is letting people know. The second runner up would have to be “Be Happy”. My FAV song on the album is Never Wanna Live Without You! I LOOOOOOVE the whole album tho! Real Love was my absolute favorite song because we search for a love that is unconditional from someone! Be Happy….what i strive for everyday!! I’m going down! For sure.